TWENTY-FOURTH DAY. --VALUE OF GOOD WORKS OFFERED FOR THE SUFFERING SOULS. The same is affirmed by St. Ambrose: "Whatever we do for the suffering souls, with a pious intention, will revert to our own merit, and will be returned a hundred fold, at the hour of our death." Prayer: O God of love and mercy! Animated with charity and compassion for our departed brothers and sisters, we offer Thee our prayers and good works, and supplicate Thee to accept them as a propitiatory sacrifice in their behalf. Through Christ, our Lord. Amen. 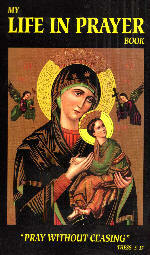 Special Intercession: Pray for the souls of those who were negligent in offering good works for the suffering souls. Practice: Bear your sufferings with patience, and offer them for the holy souls.